Introducing our Halloween cat family! 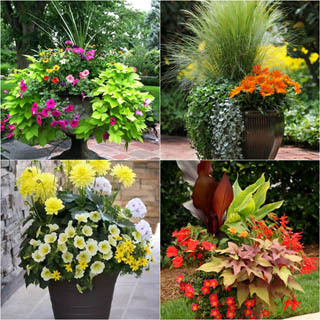 Aren’t they wickedly gorgeous? Who would guess this super fun and kid friendly DIY Halloween craft and decoration is made from …. 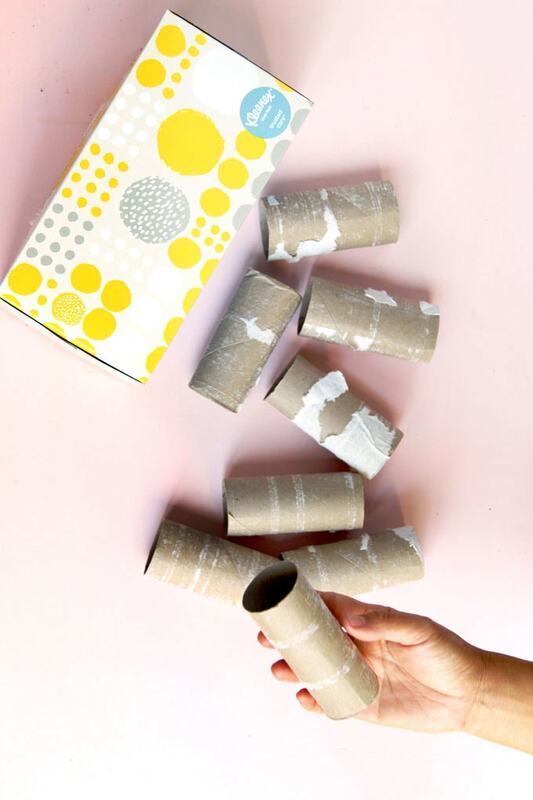 toilet paper rolls and recycled tissue boxes? To make it even easier, I have included all these cute cat faces and tails as free templates for you to download at the end! 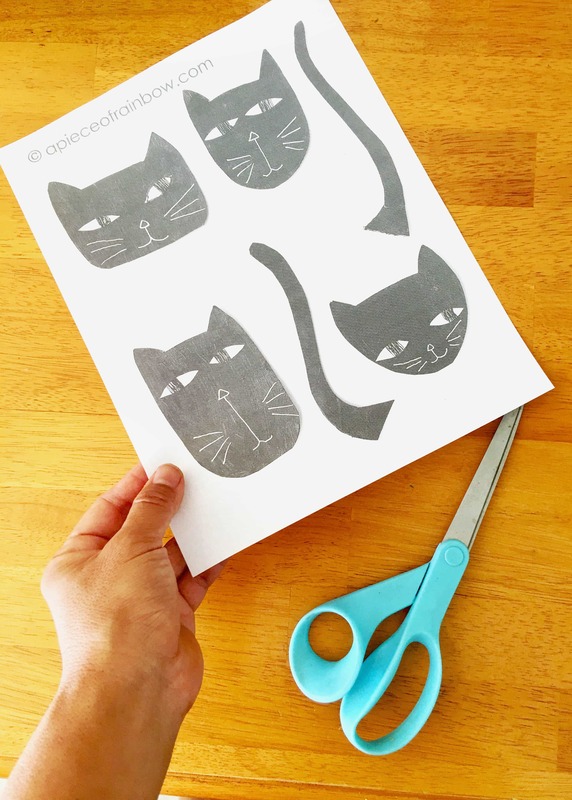 You can print and use them, or create your Halloween cat family in your own fantastic and spooky style! 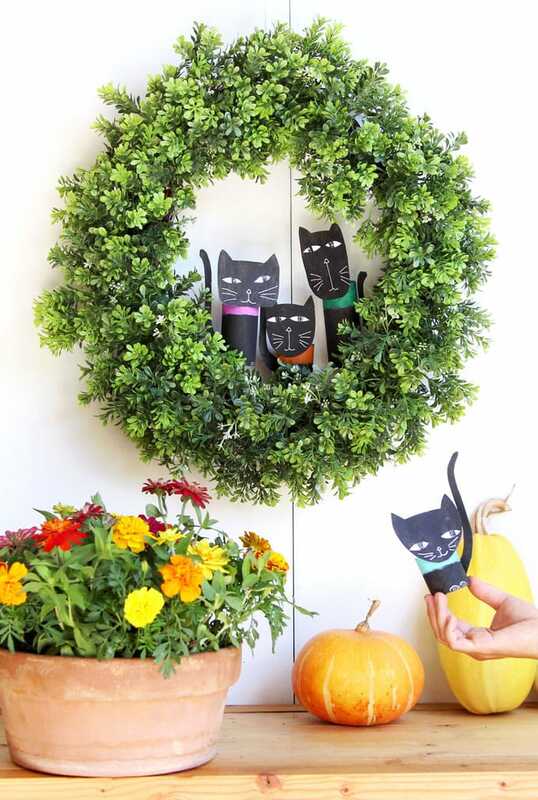 There are so many fun ways you can use these DIY Halloween cats: on a Halloween wreath, a mantel or a book shelf, or as part of a great Halloween table centerpiece! 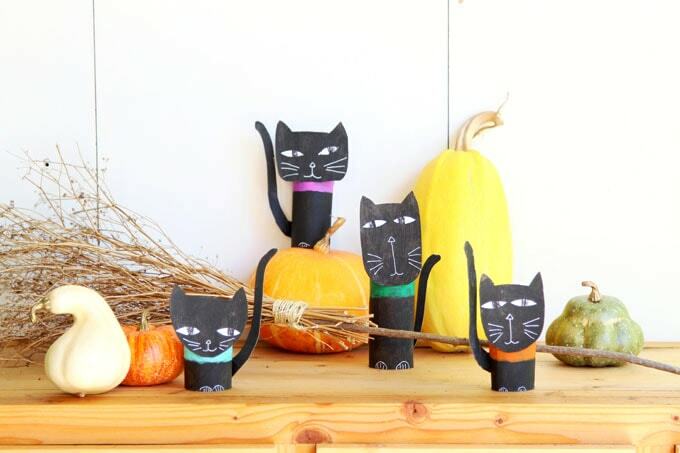 This Halloween cat paper craft is part of our easy and kids friendly DIY Halloween crafts and decorations series.You may also love these witches shoes, or these Halloween bats, which are also made from toilet paper rolls! Check out the video tutorial below, or skip to step by step written tutorial. black craft paint, and these white gel pens are great for drawing details on black! 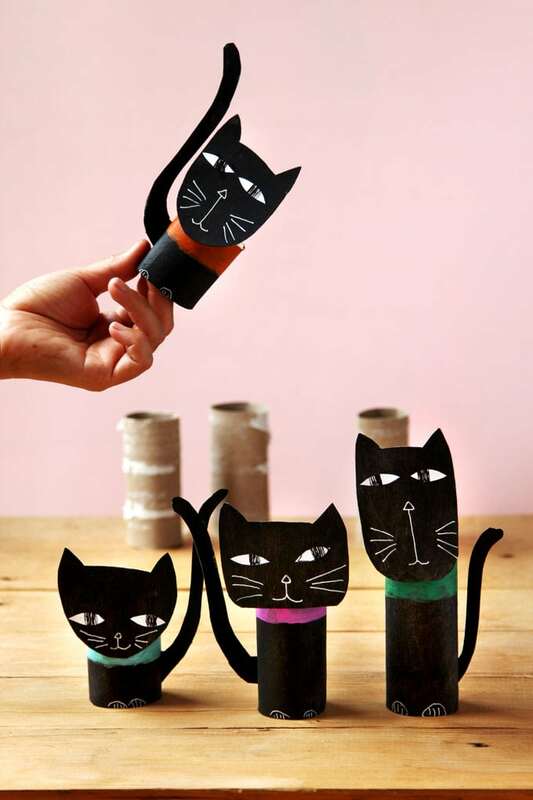 The body of each cat is made from a toilet paper roll. The baby cat bodies are made from half a toilet paper roll. 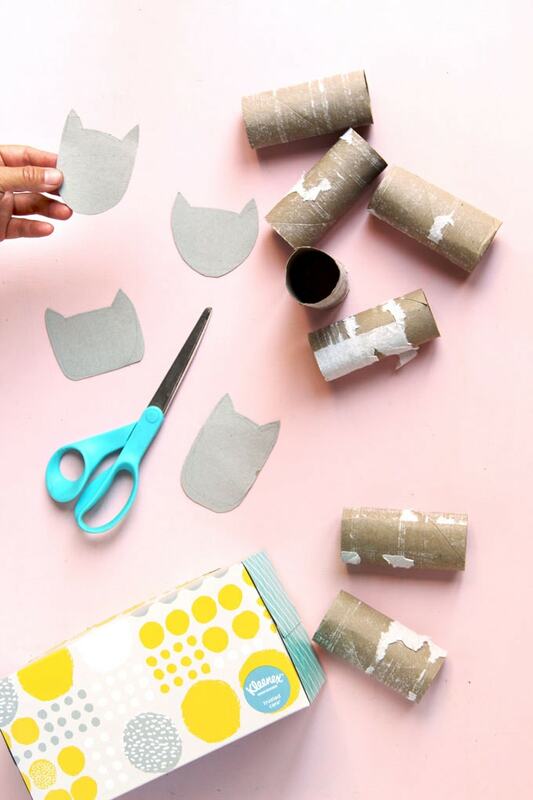 You can also cut paper towel rolls to smaller sections of different heights. 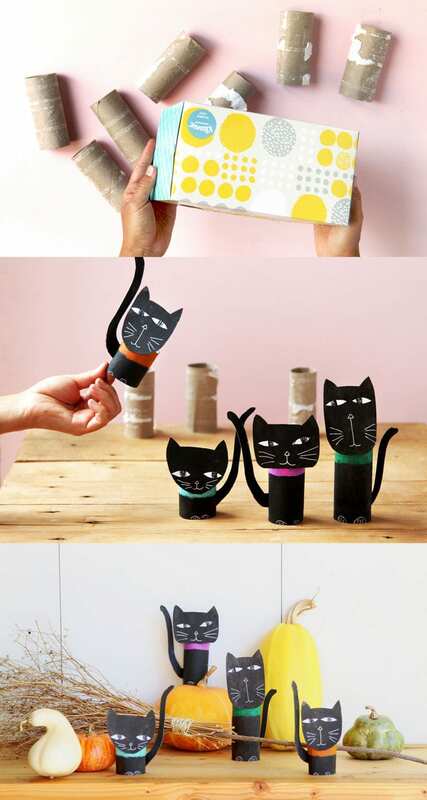 The cat faces and tails are made from cardboard paper box ( like tissue box, cereal box, etc) cutouts. 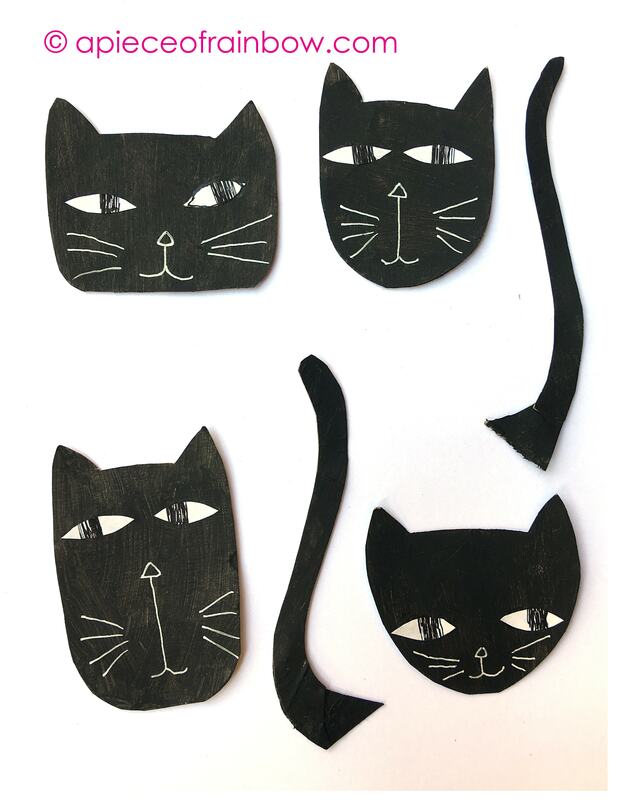 You can download the cat faces and tails templates at the end, print and glue them to the cardboard, or paint your own! I painted the upper part of the cat torsos with bright colors, so the faces would stand out more, vs black against black. 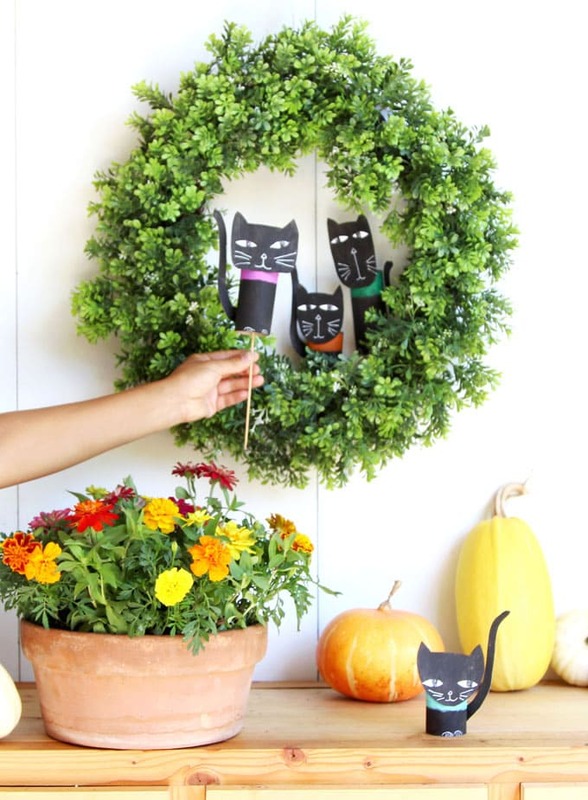 Glue everything together, now it’s time to create some Halloween decorations with your black cats! 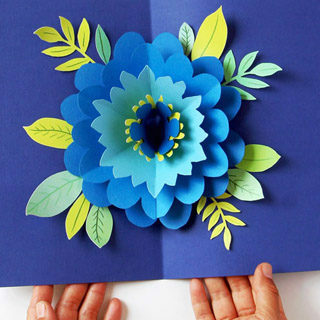 Do you love recycled crafts like I do? 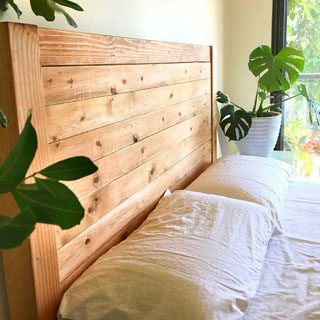 One of my favorite place to visit is FaveCrafts. 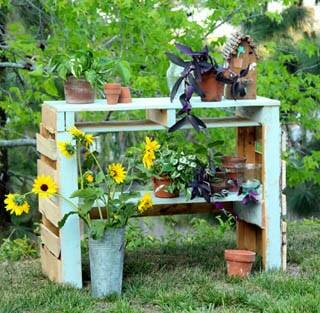 They have a section here featuring lots of creative recycled projects! 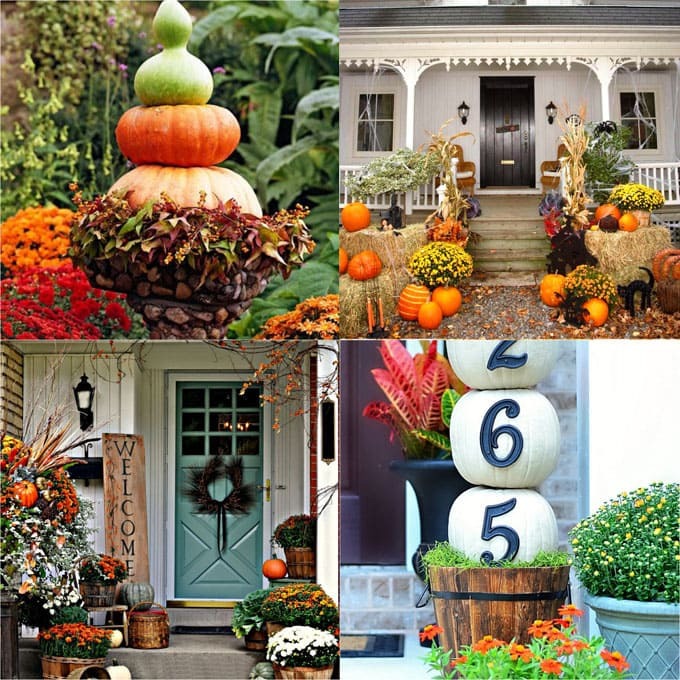 These cats look fantastic among pumpkins and brooms. 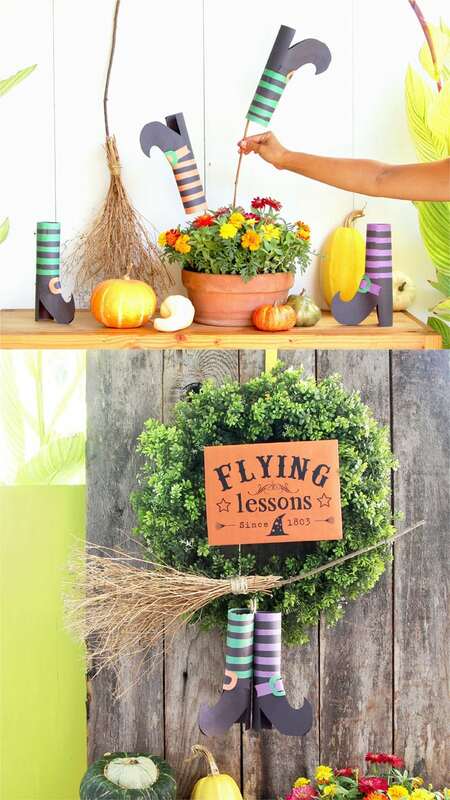 These DIY witches’ brooms are so easy to make, and free too! Here is the template of the cat faces and tails for you to download! Use them as a guide to create your own cat family! 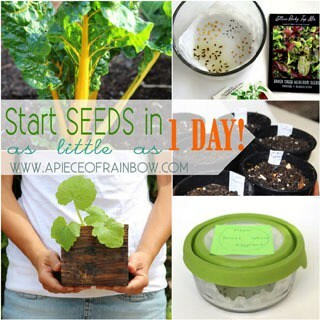 Tag us on instagram @apieceofrainbow if you make it. We would love to see it! 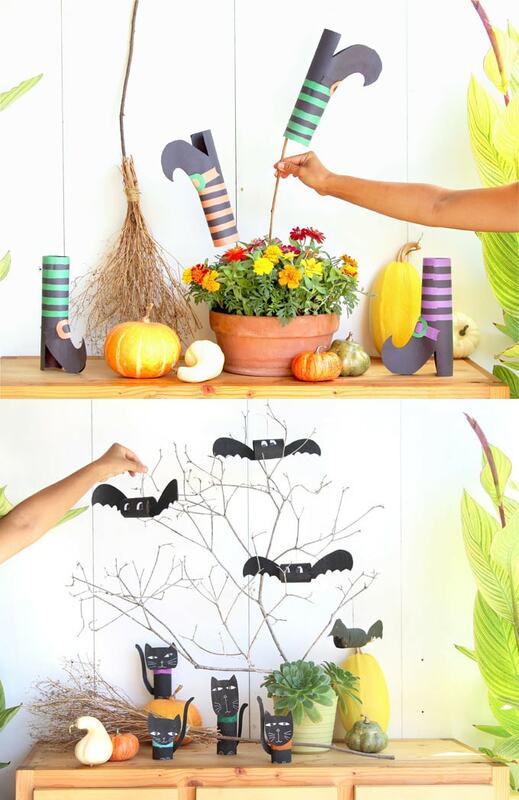 DIY Halloween Bats: super magical decor and craft! DIY Witches Shoes / Boots: just 2 piece of paper and so many uses, with Free Template! 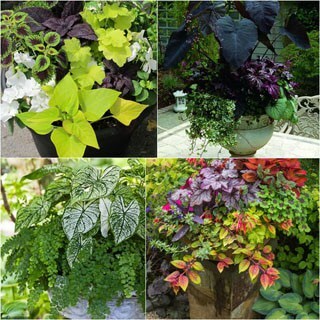 DIY Witches Broom: free, and so many beautiful ways to decorate with it! 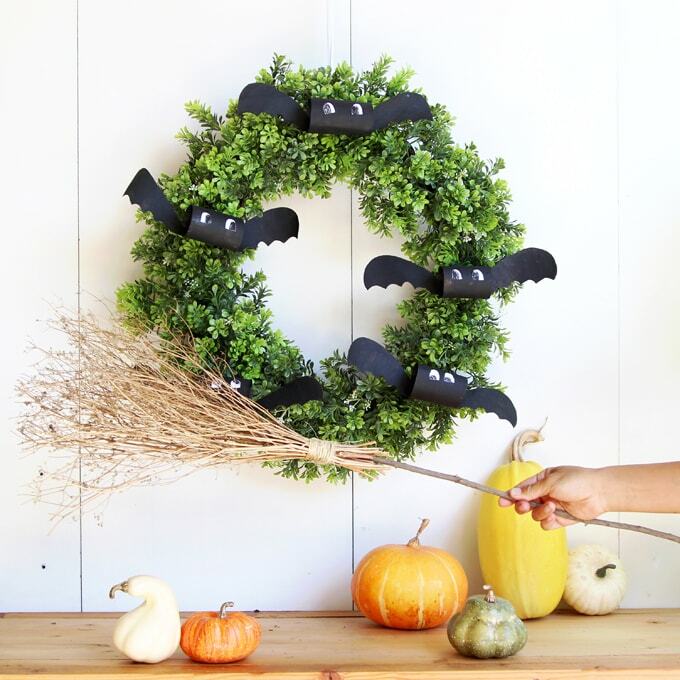 Flying Witch DIY Halloween Wreath with free printable Halloween sign. Easy & free DIY Halloween Door Decoration with free printable sign. 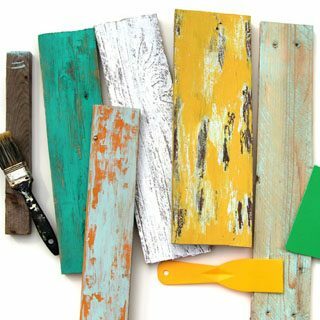 Oh my gosh, my boys are going to go crazy for this craft! They love making decorations for everything and we love cats at our house. These are so cute and fun! 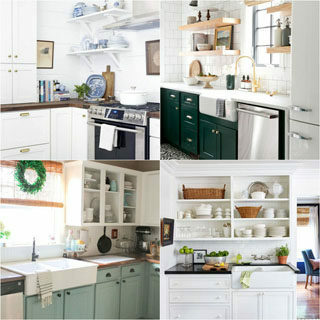 I have to train my brain to think seasons ahead- especially when blogging! This Halloween craft is so cute and best of all, easy. 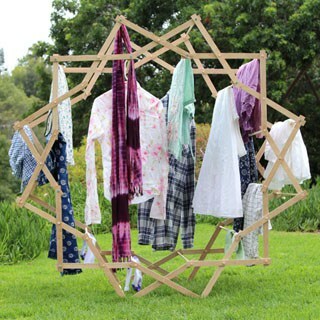 And did I say pinnable?!! 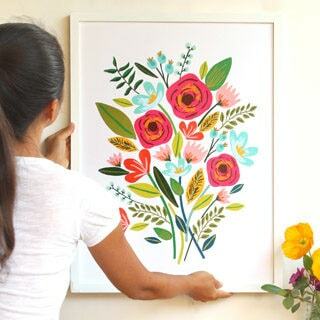 This is such a sweet craft idea! 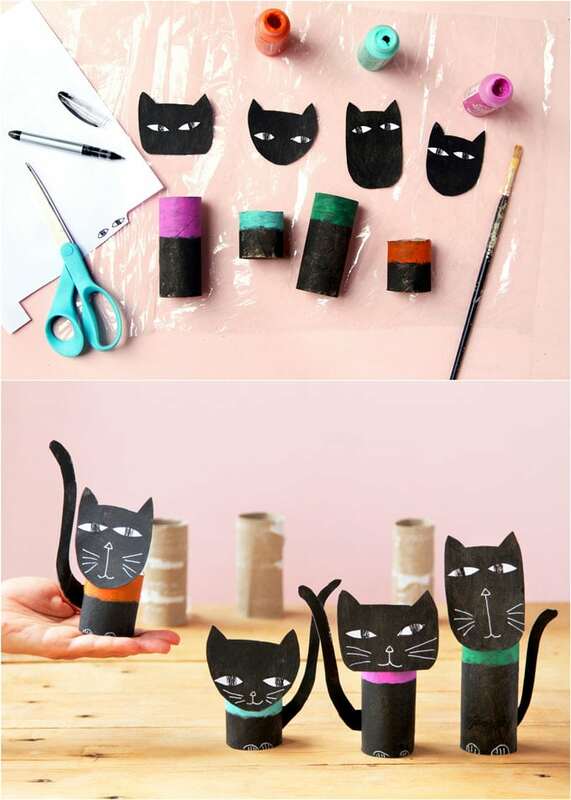 My kids are obsessed with cats so they would love to make these together! Im going to give them a try! I would never have known these were toilet paper rolls! So creative and those halloween cats are too cute. I love this project, but am having a difficult time in trying to find the download like for these cats. I have scrolled up and down several times, but do not see it. Would you please email it to me? Thank you in advance. 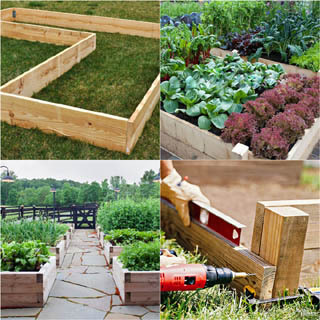 The download is in the sentence that starts with HERE. Where is the template for the witch’s boots? Just had to comment here to say that the cats are adorable! 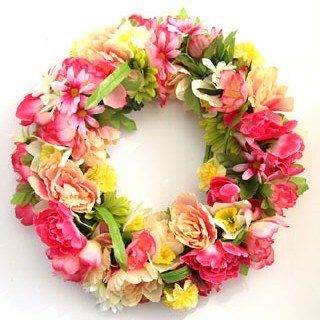 I have a box full of empty toilet rolls and I love recycled crafts, too! Pinning this one to make with my daughter.